One of the key features of the DCC site is that each text comes equipped with hand-made running vocabulary lists, containing the main definitions for each word, but also the particular one relevant to the context. Very common words are excluded. These take a lot of effort to prepare, of course, so I thought it would be good to explain why we do this. The point is not just to make it easier for readers to find the correct lemma behind a given form (something automated tools are still very bad at). It also allows for a way of teaching that focuses students’ out of class efforts on vocabulary acquisition and comprehension, rather than the (much harder task of) translation. A vocabulary-focused sight reading approach can help fight the bane of Latin and Greek pedagogy: students writing down the “correct” translation in class, and giving it back on tests, which improves their ability to memorize English, but doesn’t do much for their Latin or Greek. In essence this is what is now fashionably called a flipped classroom approach, where easier rote tasks are put outside class time, and the hardest tasks are done inside class, collaboratively. In my view the positive psychological effect of this are well worth the effort. Many classical teachers have used this kind of approach over the years. My own particular inspiration is Edwin Post, a professor at De Pauw around the turn of the 20th c., and author of the wonderful Latin at Sight (1895). I know many teachers out there are doing similar things, and would love to hear suggestions and refinements, especially things that DCC could do to better enable this kind of pedagogy. • comprehension/grammar worksheets on other passages (ones not dealt with normally in class). Textual analysis is done orally in class, through more interpretive worksheets on previously read passages, and in paper assignments. • students become good at reading Latin or Greek ex tempore. They lose their fear of it. They start to recognize word groupings and syntactical relationships, rather than isolated vocabulary items. • students have no incentive to memorize English translations; the incentive is to master high frequency vocabulary that is likely to be seen again in a new context. These items are learned contextually. • students get used to identifying grammatical features that actually occur in the text, rather than isolated grammar lessons that don’t always have a clear relationship to reading. Grammar is less a burdensome extra, but as a tool that allows the extracting sense out of a text. • Have vocabulary lists made up ahead of time. If working toward a high frequency master list, separate the lists into high and non-high frequency portions. Otherwise, just have reasonably comprehensive lists made up. Put it all on a web site for them to study before class. Quiz these occasionally first thing in class. No need to do this every day. They have an incentive to learn vocab. so as not to look too clueless in class. Midterm and final involve comprehensive vocabulary review of words already seen. • Have worksheets made up ahead of time. 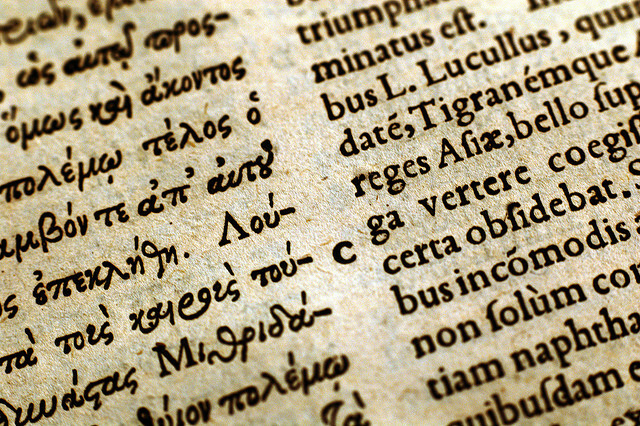 Comprehension questions can be written in Latin or Greek, and call for responses in Latin or Greek. This is very difficult at first, but helpful in the long run. Comprehension questions in English are somewhat easier, but make it possible at times for students to merely skim the text looking for key words. But one needs to be resigned to the fact that they will not glean every single nuance of these passages. This is ok. More exposure is better. For the grammar questions, have them spot several instances of a particular construction; or manipulate things, e.g., find several verbs in the imperfect and put in all six tenses and translate (this is a mini synopsis). Focus on pronouns, relative pronouns, reflexives, participles, transitive vs. intransitive verbs, finding word groupings like transitive verbs and their direct object. This kind of grammatical analysis powerfully reinforces sight reading skill. • When sight reading in class it is essential to do “pre-reading.” Give a little talk about what the passage is about, point out proper names, unusual vocabulary, tricky constructions ahead of time. That way they go in knowing what it is basically about, and will not be phased by knotty bits. • Make a point of reviewing everything. This gives lots of confidence, reading fluency, vocabulary reinforcement. • Progress to more sophisticated worksheets that include interpretive tasks, like picking out the most significant or emphatic words, judging the tone, finding literary and rhetorical techniques, inferring what the author wants you to think about what it being said. • Throughout it is important to communicate with the students what you are doing and why. The notions of high frequency vocabulary, guessing, getting the gist and not worrying so much about the details, these are things the students can get behind. With this good will you can do a lot of more detailed grammatical discussion and textual analysis. The feedback from my students on this has been good. Certainly the relationship to grammar is transformed. They suddenly become rather curious about grammatical structures that will help them figure out what is going on. With the worksheets the assumption is that the text makes some kind of sense, rather than what used to be the default assumption, that it’s Latin (or Greek), so it’s not really supposed to make that much sense anyway, right?